According to the Addis Fortune, the standard was drafted with a joint effort by the Ministry of Water, Irrigation & Electricity, Ethiopia (MoWIE) Standards Agency and Ministry of Environment, Forest & Climate Change. It was then tabled for discussion to receive comments from stakeholders in a seminar that was held in Adama recently. 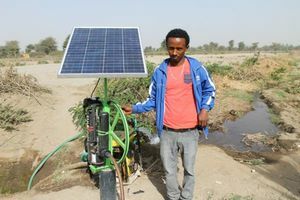 The President of Solar Energy Development Association Ethiopia, Dereje Walelgn, believes that the new standard can ensure quality, as the market has been flooded with sub-standard products. "We believe the standard will increase the use of renewable energy in the country and encourage the private sector to involve in the business," said Frehiwot Kebede, state minister of MoWIE. "Renewable energy is a priority for us accompanied by the production of clean energy sources and increasing access to power." "The standard could help the country in reaching a community which is in an off-grid area," said Zewge Worku, acting director with energy efficiency and conservation at the Ethiopian Energy Authority. Currently, the Ethiopian Energy Authority is conducting an impact assessment study to make the standard obligatory. According to Yilma Mengistu, director of standards at the Agency said: “The Standard Agency is collecting feedback from stakeholders in 60 days and will incorporate them in the draft”. The standards will become obligatory after it has been approved by the National Standardization Council. Tigabu said “If it is approved, it would help control the lesser quality imports in the informal channels,"